Ms. Garland oversees the action, as seen from the Dress Circle. Photo by Martha Wade Steketee. Note the title of the concert: not just “a tribute to Judy Garland” or “Judy Garland at Carnegie” but “The Great Judy Garland.” And to a person, each member of the audience, whether hearing these fabulous orchestrations for the first time or fans of any or all of the performers in tonight’s joint concert or fans of the Hall itself or fans of the originator of this concert set list or long-term fans of the 50-year-old recorded concert event tonight’s concert honors — every person comes away with something that moves. And in the end, it can’t be denied: Garland wins. It’s not intended to be a competition. Tonight, the performers and the conductor name in comments and honor in performance the woman whose work we are all in the Hall to remember. That long ago evening, Mort Lindsey at the podium conducted a strong orchestra and a set list that had been honed by Garland and colleagues. Honed by a life time of adventures on stage and on screen, and honed in performance (etching the outline, perfecting the delivery, testing the dramatic arc of the pacing) for several months immediately preceding that April 1961 concert and on into 1961 for many concerts more. Other tribute events over the years have attempted to capture and present some semblance of the essence of the woman and the night and the set list presented on Sunday April 23, 1961 in this same Hall. Tribute concerts in the past have sometimes involved a variety of performers taking on a song or two — such as Lorna Luft’s two night, multiple performer celebration of her own in June 1998 in this Hall. Another event in June 2006 involved one individual performer (plus family members and sometimes special guests) who attempted to stand in Garland’s shoes and engage in performance art of some sort related to this concert. So tributes have happened in this Hall and elsewhere over the years. The honor is real, yet the Garland class and power outshines. Tonight, four very different performance styles sing around the edges of Garland’s majestic instrument and spirit. Broadway performers Ashley Brown, Karen Olivo, and Heather Headley take their turns, as a group and individually, with tunes from the set list. Each performer has moments of sweet synchrony with individual tunes. Ashley Brown’s melodic (but not gutsy) soprano hits me as overfull and with a broad vibrato that distracts from the lyrics themselves. Her takes on the “Almost Like Being in Love/This Can’t Be Love” medley and “Alone Together” feel swooping and surface; on “Who Cares?” I ache for the jazzy vocal delivery that the driving orchestral arrangement invites. “If Love Were All” is pretty, soprano, hardly emotionally reflective. Through the evening, my biggest impression is: she sings the notes but doesn’t communicate the emotion. After this response all evening, Ms. Brown’s specific, simple, direct, on point delivery of “Over the Rainbow” actually shocks and delights me. No prelude (brilliant choice), just jumps right into the pivotal tune, the larger-than-life legacy tune of the larger-than-life performer at the core of this evening is brought off simply — until the final few phrases during which Brown embellishes the melody unnecessarily. Karen Olivo has serious Broadway performance credits including In the Heights and a Tony Award winning turn as Anita in the recent revival of West Side Story. She seems to warm up as the evening proceeds and I appreciate her treatment of a few of the tunes in particular: “Zing Went the Strings of My Heart” with a big brassy big band feel to the accompaniment perfectly matches her snappy delivery. Her gentle treatment of the delicate Rodgers and Hart tune “You’re Nearer” is sweet and spot on. Olivo is tasked with delivering “Get Happy” which was not part of the 1961 set list, instead of the Garland concert standard “Swanee”. The replacement is not explained and more than slightly taints for this Garland fan any claims the evening makes to honoring the 1961 concert as originally delivered. Heather Headley is a singing actress, and singer who acts — the real deal and for me the highlight of the evening. She delivers some classic gems with quality unique interpretations: “Do It Again” sells the sensual delight of this slow-paced arrangement, “I Can’t Give You Anything But Love” with an aching sax solo that delivers its own special twist, a jazzy “A Foggy Day” that delights me, a powerful “Stormy Weather”. Headley gives me something new while honoring the source material. Daughter Lorna Luft has a big sometimes barely controlled instrument that comes across to my ears as brassy and emotionless — she has the moves and is certainly comfortable on stage with a big Las Vegas presence, but when it comes to telling a story in a song she leaves me unmoved. “The Man That Got Away”, “Come Rain or Come Shine” and “Rock-a-Bye Your Baby” receive the Lorna full stage big voice treatment. As she says in a story about herself as a child: her mother said of her “Lorna likes the loud ones”. And yet, Lorna’s presence adds a special something to the proceedings. The stage images of Lorna looking back at the image of her Mom looking down, the knowledge that this woman on stage watched the performer 50 years ago on this same stage — well, it gets a bit meta and wonderful and frankly theatrical. And Lorna’s well-practiced stories are lovely to hear. She notes that when people ask her if she remembers the concert she experienced as a child, she says, recalling the pandemonium in the audience that evening: “I had never ever seen grownups act like that.” She goes on to say that she is “honored and grateful to be here with this amazing orchestra on this amazing night to celebrate this amazing woman.” Yes, thank you, truly. The inspired lighting design captures the essence of the experience. 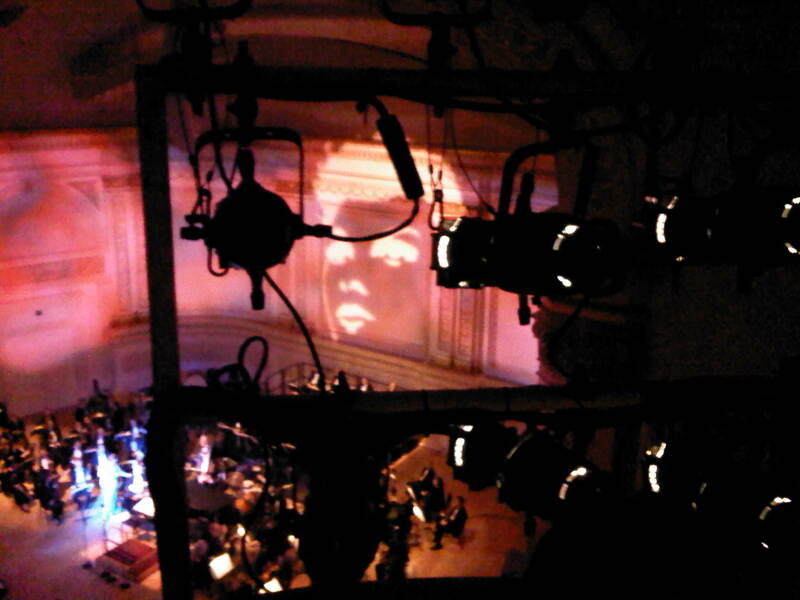 Garland reflecting, calmly, on the proceedings via a projected version of the poster art that was used during the era of her concert career. The orchestrations are presented in thrilling manner. And the Garland splendor endures. I expect that I shall return for concert events that honor this set list and this evening over the years. I don’t look for a single performer to embody Garland’s spirit nor do I think it even appropriate for a single performer to attempt the set list, attempt to embody, attempt to stand in her shoes. It is always possible to honor Garland’s spirit and her legacy and honestly, to hear the overture played in this magnificent Hall is worth the price of admission. How about playing the recording of the concert through state of the art playback equipment in this Hall sometime? I’d pay good money to hear “Judy at Carnegie Hall”, a recording I have worn out in its various formats (LP to cassette to CD multiple releases), played in this hall. That would be something.